Custom metal fabrication requires significant skills, and you don’t want a rookie taking on your job. You’ll need professional, experienced craftsmen to get it done right and to produce the highest-quality results. Our metal workers have spent decades dealing with a wide variety of metals, the primary one being carbon steel. We have cutting-edge laser technology that allows us to cut carbon steel up to ¾” x 5’ x 10’. Working with Allegheny Metals Corporation, you have access to our state-of-the-art cutting center, supported by press brake forming, welding, assembly, and our team of highly trained metal workers. We enjoy using our tools to tackle the diversity of projects our clients bring in. So call us, and we’ll tell you how to get your project done quickly, accurately, and economically. 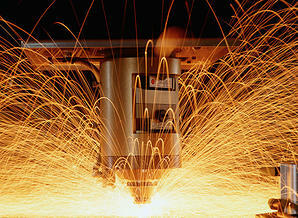 In our 4,000-watt Mitsubishi Laser Cutting Center, we are able to tackle most types of jobs. We can cut carbon steel up to 3/4″ thick, aluminum to 3/8″, stainless steel to 1/2″, and even plastics – up to sheet sizes 5’ x 10’. Whatever shape you need, we can cut it accurately and with optimum cutting speed. We are able to cut 4’ x 8’ carbon steel sheets up to 6” thick. When it comes to press brake fabrication, Allegheny really puts the pressure on. We take on anything from simple brackets to intricate metal housings, and everything in between, guaranteeing a level of precision and versatility that is unbeatable. With our equipment, we are able to press brake form carbon steel as thick as ¼” (depending on length). We do press brake forming for carbon steel, stainless steel, and aluminum. Our precision sawing tools can cut products up to 25” in diameter. We are capable of sawing any structural steel (I-beam; angle, channel, etc.) and metal tubing and bar with precision accuracy for any of your cutting needs. Our saws are all horizontal feed with automatic indexing that can be programmed for your specific cutting preferences to ensure accurate quality cuts every time. Allegheny staffs certified welders, meaning employees who are the most proficient in their field. By providing certified welding services, we offer our clients the level of professionalism they want and expect. Our 10′ x 20′ state-of-the-art paint booth can handle any of your grinding, deburring, paint prep, wet painting, and finishing needs. We offer high quality finishing services for any of your fabricated products.